Do you have problems with consistency? Of course you do. We all have problems with consistency in some part of our lives. We all have that one thing that you wish you did more because it would make something better. I want you to take a minute and think about "that thing." There may be a few things, but think of the one thing that's most important for you to change. By the end of this article, I'm going to help you to become more consistent in whatever it is that you're thinking about right now. Why is consistency so important? Simply stated, because consistency is a direct factor of success in reaching your goals. It's hard to make a sudden huge change in yourself, it would be like moving a mountain. However, if the huge change you're looking for is the effect of a number of small but consistent changes in your behavior, it's not quite so scary and it becomes possible. I'm going to talk primarily about consistency in exercise and healthy eating but this really applies to anything that you thought of in the last paragraph. Here are 4 steps you need to do to become more consistent. The first step towards consistency is prioritizing what it is that you want. In March of this year, I wanted to start working out, but didn't. I knew I wanted to. I spoke about it. I thought about it. I just didn't do it! Part of the reason was that it just wasn't a priority in my life. There were too many things that were more important than me working out or making good choices when it came to eating. We all have priorities in our lives. It's much easier to tend to the more important things and tending to those priorities can keep us very busy. Things that aren't as important to us, may not happen on a regular basis (oh, hello laundry). As a wife and mom, my husband and kids are my priority. Everything that I do is in someway connected to them. So with that in mind, why wasn't my health a priority? When I realized that my health actually was connected to my biggest priority, my family, that was when I really started feeling a motivation to get healthier. Sure, there was the desire to look better, and the fact that I didn't have a lot of energy but when I started connecting the fact that I was unhealthy with the fact that I could die young, or that I may not be available if my family needed me due to sickness, or that I was delivering messages to my daughters through my own actions that health wasn't important, that really made it click for me. Chances are, whatever you'd like to be more consistent in has a strong reason behind it, but you may need to think about it for a minute. It took me a year to figure out. But once I figured it out, there was no stopping me. The second step towards consistency is not taking no for an answer and finding someone to keep you accountable. 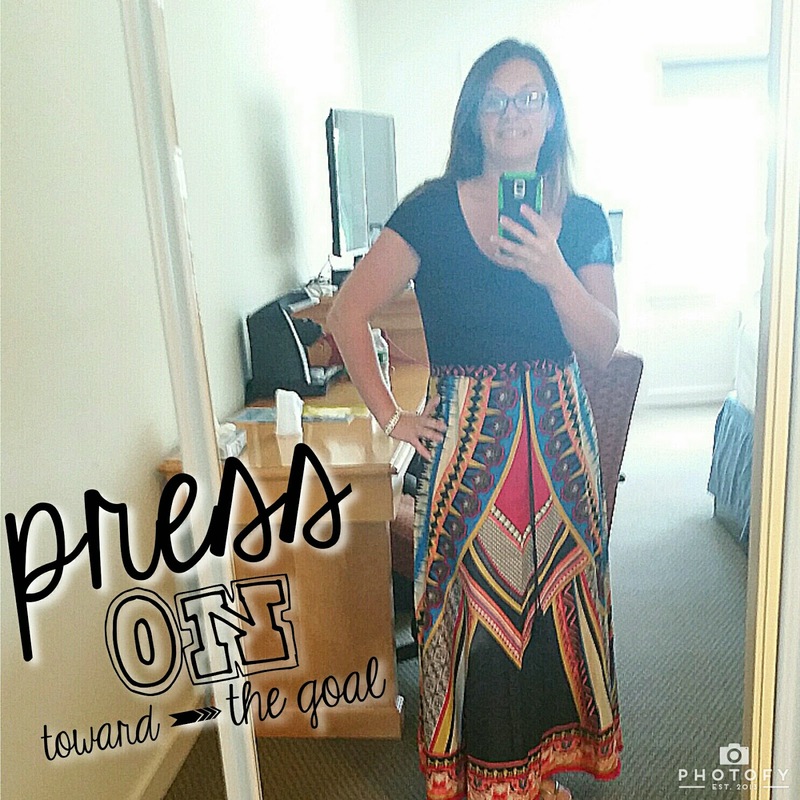 Once my health became a priority, I started taking action. I wasn't totally sure where to start because time and being so busy was still a factor, but I knew that I wasn't going to let time keep going by without me finding my answer. I knew I couldn't go to the gym because of time and my husband wasn't really on board with me going when he got home from a long day at work. I'd worked out at home before so I knew that would work but working out at home is easy to give up because nobody is watching. Before I knew exactly why I wanted to get started, these all would have become excuses and reasons for me to quit before I really even started. But this time I didn't take no for an answer. I kept looking until I found my answer. Someone to hold you accountable doesn't have to be someone doing it with you. That can be too hard to find depending on what your goals are and yet another reason to give up. The person who will keep you accountable just has to be someone you can tell about your goals. Someone you can talk to. This works best if it's an accountability partner. If you're trying to lose weight, they don't have to be trying to lose weight, they just need a goal. It can be spending more time with their kids or spending less money... anything. The best partnerships are formed when you both have something you'd like to help each other work towards. Luckily, I came across my coach and she was starting a group. So I got to join a group of people who all had the same goal and trust me, this helps. If fitness is your goal, I can help match you up with accountability partners and it makes the whole experience better and much more rewarding when you have people to celebrate with when you reach your goals. The third step towards consistency is consistency. 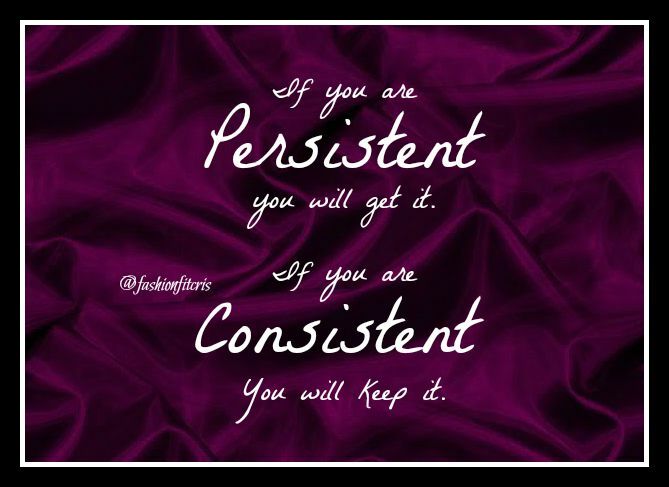 Consistency is defined as a steadfast adherence to the same principle, course, form, etc. 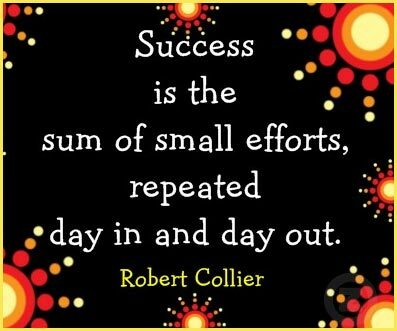 Your first goal towards consistency should be something small. Don't list 12 things you'd like to improve. Just start with 1 thing, but make it meaningful to you. Also, your first goal should be just 7 days. Even in the first 7 days, there will be days you don't want to do it. That's when you have to think of the first step I spoke about, and connecting it with your priority. If it's important, you will make it happen. Do you come up with excuses to not feed your kids? It needs to be that important. Another thing I see often when it comes to consistency is people taking off on the weekend. For the next 7 days, I want 7 to mean 7... not 5. From my own experience, there is a huge difference in mindset when you do something every single day. I'm not a scientist so I can't explain why, but I've tried both and the 7 days in a row is what really made the difference. Plus, if you mark the calendar when your first day is, you get to say you did it every single day. That feels amazing when 7 days turns into 14 and eventually 50 or even 100. Keep it going! It will become another reason you don't want to stop. Once you get to the 7th day of whatever it is you wanted to do, celebrate! Then set your next goal, 7 more days! After the 14th day, celebrate some more! Then set your next goal, 7 more days. This is consistency and what it feels like. From my own experience, connecting with the reason you started on a daily basis and doing whatever it is you decided to start, will absolutely become a habit in 21-30 days. I've seen this work. 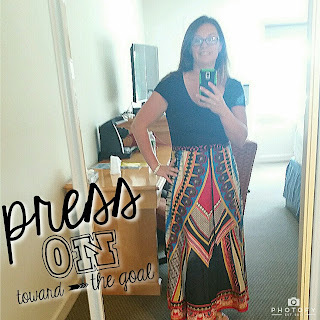 Have you heard before that it takes 21 days to make a habit? I challenge you to try it for yourself and get to that 21st day. 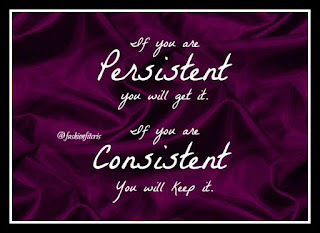 The fourth step towards consistency is persistence. 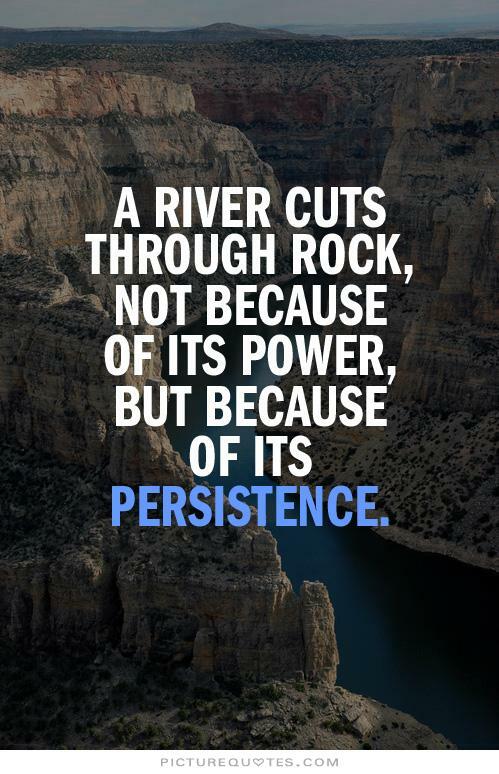 Persistence is defined as firm or obstinate continuance in a course of action in spite of difficulty or opposition. 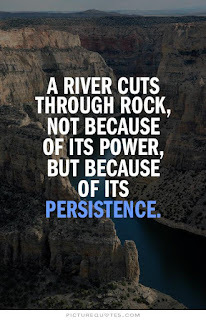 Persistence and Consistency go hand in hand. The difficulty or opposition you face may be you! Don't listen to the excuses in your head. Just keep going. Persistence and Consistency are what lead to real results. If it is fitness, you may be sore, if it's eating better, you may be hungry, if it's growing a business, you may be tired but just keep going! Don't give up! You won't regret starting but you may regret stopping if it means never reaching your goals. In exercise or just about anything, a small change for a week, really won't be earth shattering. But a small change over a year may lead you to be a truly better version of yourself. A small change for 5 years will lead to a supremely supreme version of who you once were. Don't think in terms of that year though. Just go day by day, week by week and then a year from now, you can look back and see how far you've come. There is one more thing that I'd like to add that isn't a step towards consistency, but simply an observation. Picture whatever it is you chose to start, as an opportunity to reach your goals and be successful. Don't see it as a chore, or something you have to get in. Life is all about your attitude. You can be positive or negative. 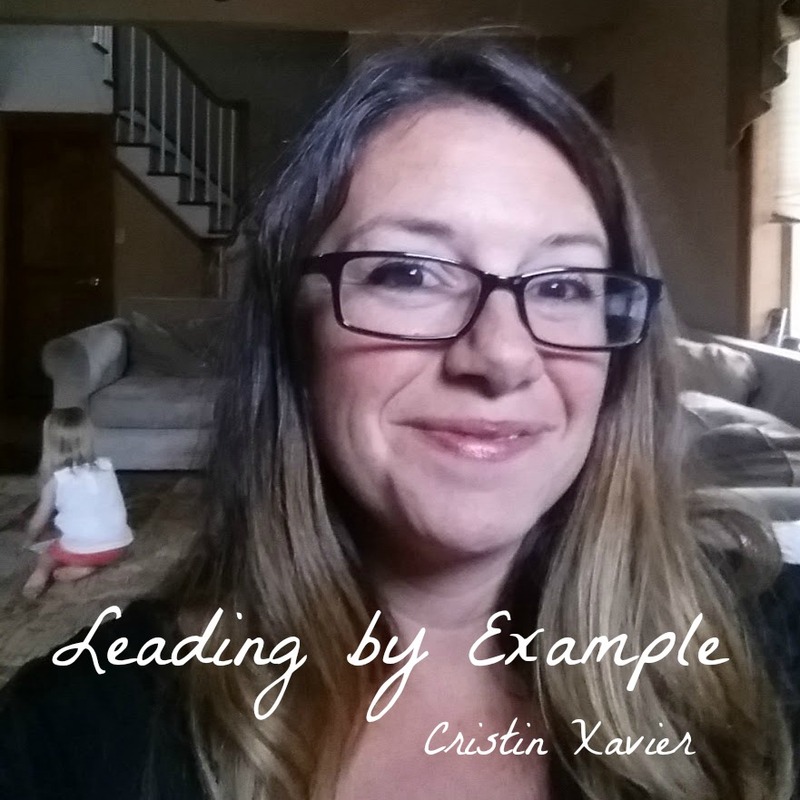 You chose this thing that you'd like to be more consistent in because it's important to you. If you look at it as something you have to get in, you won't want to do it. Put a positive spin on it and it will be much easier. Feel free to comment below on what it is you chose to be more consistent in. I'd love to hear what you're working towards.